The next 99 would split $550. The poorest 900 share $225. The GOP Tax Reform Bill gives even MORE of that economic pie to that one fictitious guy. Corporations are currently sitting on $2.3 trillion dollars that could easily be shared as wages but the last thing these oligarchs want is a population that can afford the rent. They want us living five to a room and working for nothing, with no health care. And their next trick is to steal you social security and your Medicare. I'd suggest an equivalent to storming the Bastille but the police have been militarized (Thank you, PATRIOT Act) to the extent that any American (except those shooting 500 people from a hotel window) daring to exert their right to assemble can be considered terrorists. Make no mistake about it, this Tax Reform bill will be catastrophic. Call your representative today! "For all you kids watching at home, Santa just IS white." "Santa is just white? Who are you actually talking to? Children who are sophisticated enough to be watching a news channel at 10 o'clock at night, yet innocent enough to still believe Santa Claus is real, yet racist enough to be freaked out if he isn’t white?" Lefty: There’s rising income inequality, increasing federal debt, Too much off-shored corporate profit, stagnant wages, and too many tax loopholes for the insanely rich! Leftette: Could it get any worse? 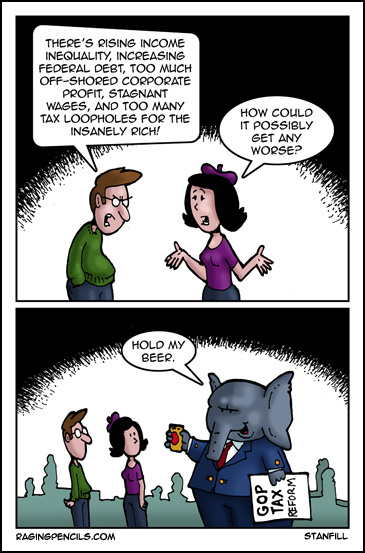 Gop elephant: Hold My Beer".